The first class started as an introduction to the course in the classroom. I was suspecting something was up as everyone in the class were wearing knee-high rubber boots. 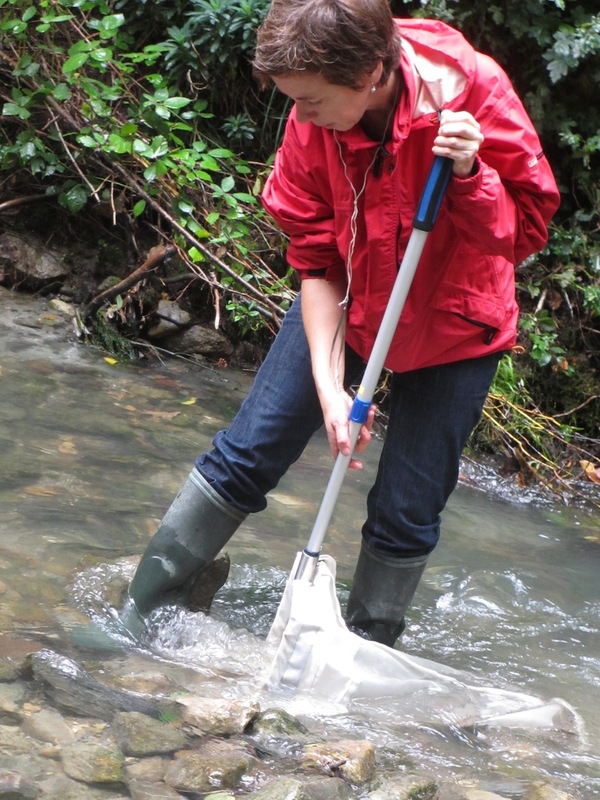 Indeed, after the introductions, we immediately went outdoors to the nearby river Sorge to see how to collect samples for analysis of macrozoobenthos (organisms that inhabit the water, and visible to the eye). In the second session, we divided into groups so that we could sample at different points of the rivers. The idea of having measurements of several parameters along the river is to be able to geographically narrow the sources of contamination, as well as to see the effects on the health of the river. Our team was the most downstream point of collection (#6), near the university campus, and applied what we had learned in the first class to collect samples of sediment, water. We recorded the temperature, pH, flowrate, conductivity and pO2 (dissolved oxygen) in situ, and estimated the flow rate by timing how far a leaf floated downstream given known distance. We returned and prepared the samples for future analysis: drying the sediment in the oven (calculation of % water in the sample), keeping the water samples at 4C. The water samples for macrozoobenthos analysis was left as is as we had fixed them with ethanol on site. 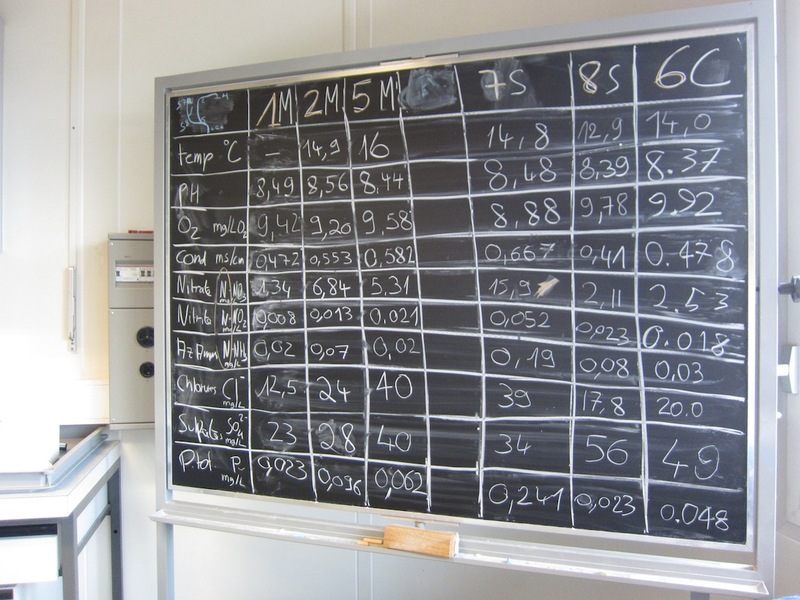 The third session was in the teaching labs,- where we determined the “macro parameters”, which included water phosphate, chlorides, sulfates, nitrates, nitrites, phosphates, and ammonium. These are water soluble chemical indicators of pollution, and aquatic balance. Interestingly, the tests were based on chromogenic sample analyses using kits from Hach-Lange. Aside from the kit itself, all we needed were vials, and spectrophotometers. The summary of analyzed parameters and their principles are available in a separate entry. Organic carbons (total and disoolved – i.e. after filtration) were analyzed using a Shimazu TOC-V, as CO2 by non-dispersive infrared gas analysis. Fourth session, we extracted pollutant family of Polychlorinated biphenyl (PCB) and heavy-metals in the sediments. PCBs are a family of compounds known for their carcinogenic, and non-carcinogenic, but as alarming health effects. Toxicity of heavy metals are also well known. These compounds are associated with silica, or heavy, and therefore, not dissolved in the water itself. Therefore, they had to be extracted by organic solvents (for PCB) or dissolved in heated nitric acid. This part did not rely on kits and we were even pouring our own Florisil column to adsorb and isolate the PCBs. The final analyses of heavymetals were done not by us, but by the experts running Inductively Coupled Optical Emission Spectrometry, similarly, gas chromatography with mass spectrometry detection for the PCBs were done also outside of our laboratory work. The fifth session was where we took the water samples fixed in ethanol, and looked for the macrozoobenthos. This was microscopy, and looking at the identification charts to chart the diversity of the species. We should get these charts! It was quite impressive the drop in biodiversity comparing between the river source, and downstream close to the lake. What is interesting is that each year, this is analyzed once by the students. This is just a “snapshot” of the situation, and year to year comparisons are too far in between to get a sense of what may be going on in the river. How do we understand the fluctuations of what occurs in the rivers? This is something that we need to pay attention to further.